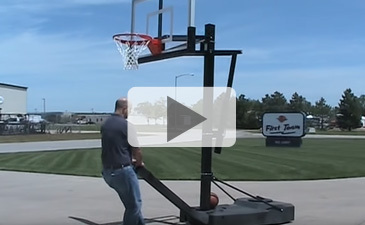 OmniSlam Portable Basketball Goal | First Team Inc. 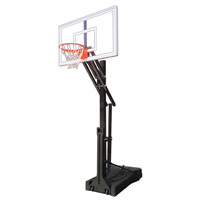 The OmniSlam is a great way to upgrade your court. Indoors or out, OmniSlam is a premium quality performing portable basketball hoop! The OmniSlam is significantly better in performance and durability than portables found at large sporting goods chain stores. The large poly base is designed to hold up to 500 lbs. of sand for maximum stability. No more flimsy portables that blow over in the wind! The rugged 4" square one piece 11 gauge post will not wobble and separate like sectional posts. The handy cam lever handle on the front makes one person transport simple over any hard, smooth surface. The OmniSlam is adjustable from 10' down to 7' in six inch increments. Adjustments are very quick by removing the slide pin on the back of the post, the spring balanced design makes rim height adjustments quick and easy. Replace the pin for play. 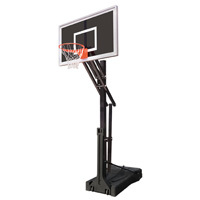 Various backboard sizes and materials are available to choose from. For added safety, a contoured post pad is also available in an array of colors. To dress up your home court, choose First Team's post pad custom lettering option. Because it comes from First Team, you know it's 100% Made In the USA and that means quality. When you are looking for a portable basketball hoop to fit your performance demands that won't break your budget, choose First Team's affordable portable, OmniSlam!